In the first 52 Weeks of my journey, I visited the Harvey Church of Christ in Harvey, IL. 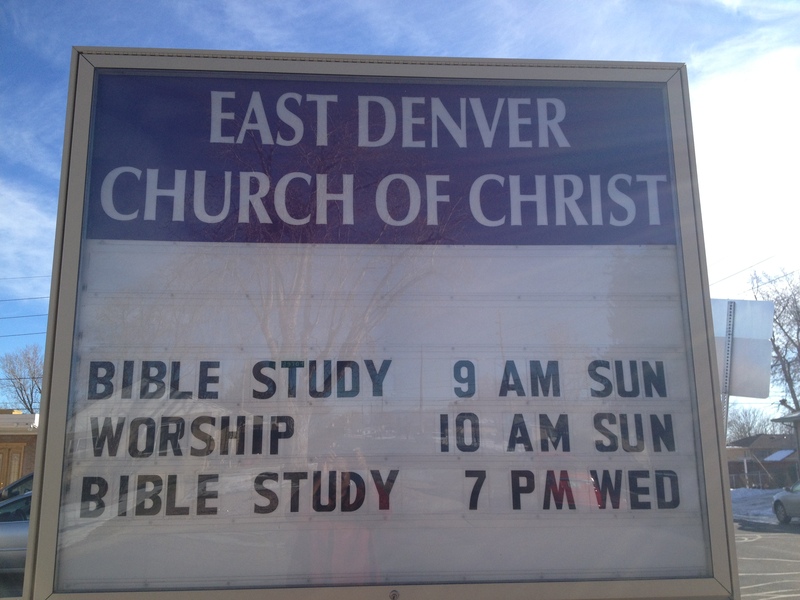 That was a majority African-American congregation, and the East Denver Church of Christ was as well. When I walked in, two older Black gentlemen greeted me, and they were decked out – one wore an electric blue suit, matching blue trouser socks, and blue (faux?) alligator shoes. The other wore a pinstriped suit and shiny black wingtips. Sunday best. “Would you like to fill out a visitor’s card?” He asked. “Well, I am visiting from Chicago, but I would be happy to fill out a visitor’s card” I replied. He went to get a card and a pen while the second gentleman played the “Do you know game” with me – he asked me if I knew one of his friends from college (no), then told me that he had a lady friend who lived in Chicago (that’s nice, but I didn’t know her either.). It was fun to make conversation with these gentlemen, and after I filled out the visitor’s card, I asked them where the sanctuary was. They pointed me in the right direction. The inside of the sanctuary was not fancy. Simple and clean, there was a pulpit up front, with a chair and some flowers on either side. In front of the altar, there was a table, covered with gold communion plates, each topped with a cross shaped handle. There were additional fashion statements being made by the women attending service today – some memorable church hats – one covered in furry leopard skin, and another covered in gold sequins. Before the service started, I watched people hugging and catching up with each other. It was clear that this was a close knit church community – so much so that I received a visitor’s welcome many times over as people noticed me prior to greeting friends and family. They asked me where I was from (Chicago), and what church I attended (um, that’s complicated), and I made small talk until it was time for service. The music at this service brought me home, too. Every song was sung a cappella, no choir, no instruments. There was one musician in the back of the choir with a microphone. He was providing the bass to accompany the soloists. Amazingly enough, the same song that I had heard during my time at Harvey Church of Christ, was the first song that was sung this morning at the East Denver Church of Christ. It is a song that I had heard many times in my time at my home church, Trinity. I am not sure if it is a Church of Christ staple, or just one that is popular and familiar in many Black churches. In any case, hearing it gave me a feeling of familiarity and continuity—and throughout the service, one gentleman led us in several other a cappella selections, including other familiar songs like: “Have a Little Talk With Jesus,” and “Soon and Very Soon.” I enjoyed the music today as I had when I visited the Harvey Church of Christ, last year. The topic of the sermon was familiar – the pastor talked about Faith and Light, and focused on scriptures from Hebrews and 1 John. There was only one thing that happened that I had never experienced before –whenever it was time for prayer, the lights were turned out, so we prayed in dim light. When the prayers ended, the lights came back up. I am not sure why that happened, but next time I talk to my friend who is a member of the Church of Christ, I will ask him! The church was small and very welcoming. When it was time to welcome visitors, it turned out that I was the only one who had turned in a visitor’s card. The pastor introduced me, and I extended greetings from Chicago to this congregation in East Denver. Afterwards, I was surrounded by worshippers who hugged me, told me a little about their city, and welcomed me. I even got an invitation to lunch, when I told one church member that I would be in town for a few days! Travelling gives me the opportunity to continue to interact with new people in new worship environments – and I learn something every time.